Hauling a heavy trailer is a difficult task without the help of a weight distribution hitch. If the load is not properly equalized between the towing vehicle axels, the steering and braking could be unresponsive. Along with potential swaying from the trailer, this is quite dangerous when you are traveling on the road. That is why having the best weight distribution hitch installed is essential for a safe and uneventful trip. Should you happen to be in need of one, this article will introduce to several quality products. As with anything else, it’s important to pick a product which can match your demands and requirements. 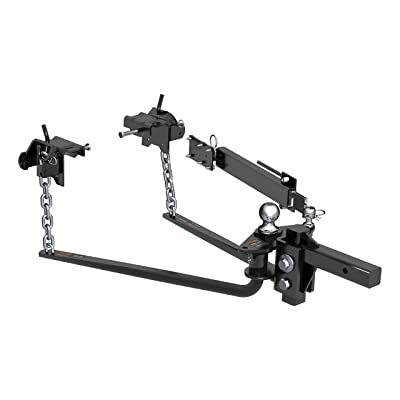 There is a wide range of weight distribution hitch brands and models with different characteristics. If you don’t think it through and buy on a whim, you may waste a lot of money for little gains. In the worst case, an inadequate hitch could lead to disastrous traffic incidents so be careful. That being said, as long as you ensure a hitch features and specification are ideal for your towing needs then it’s good. A nice combination of high capacity and versatility, you can hardly find a better product than the Andersen 3350 with these qualities. This is a universal hitch so it’s compatible with a variety of vehicle and you can put it in relatively quick. All it takes is around half an hour and then the hitch should be ready, thanks to the robust one pin installation. Even if you have little to no experience dealing with a hitch, you shall have no trouble equipping your vehicle with this hitch. The chain will automatically resolve any trailer swaying which you may face. At barely 60 Pounds, Andersen 3350 is much lighter than the others that are approximately 100 Pounds. With such weight, the hitch GTW and TW ratings are excellent at 14,000 and 1,400 respectively. Its operation is rather quiet as well so you won’t be disturbed by annoying noise while you use the hitch. One notable issue remains with this hitch though and it’s the price tag. 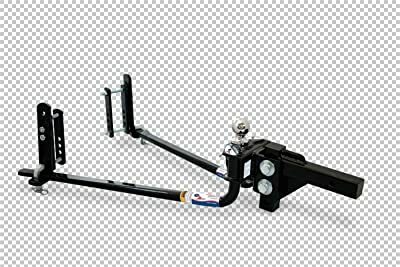 This hitch is one of the most expensive products in its category. If you are shopping on a budget, Andersen 3350 is not really an economical choice. If sway control is one of your priorities, you would love to have Reese 49902 for towing tasks. Excessive swaying due to crosswind or weight is troublesome and potentially dangerous. With this hitch, you never have to worry about that anymore. It stabilizes the towing vehicle through the friction sway control and ensures a safe towing experience. The hitch utilizes solid steel in its component so this is a heavy product at over 100 Pounds. Its spring bars are flexible and durable so the hitch is effective and will get the job done. Assembling and installation are easy to carry out because of the detailed instruction that comes with the hitch. The use of steel makes the Reese 49902 sturdy but also slightly laborious to handle. Overall, this is an affordable product which fit most people wallet. The weight ratings are sufficient for the average towing need and it will give you a smooth time on the road. Its tension and height are adjustable to better match the current situation. If you are searching for a practical and usable hitch, you won’t go wrong with this one. Come with all necessary components and sway control system, CURT 17063 is created with towing comfort and ease of installation in mind. Its round spring bars are forged from steel which permits a steady performance whenever you use the hitch. Everything is protected by a carbide powder finish which is tough and prevents rust from forming. The brackets employ a snap up design that along with the lift handle make the spring bars leveraging a simple task. One helpful feature is the grease zerk fittings that ensure the bars are adequately lubricated. CURT 17063 is a heavy product at around 100 Pounds but its weight rating is admirable nerveless. Anything you need to install the hitch can be found right inside the box. The convenient attachment on the hitch allows you to directly mount a sway control without much trouble. A trailer ball is also provided in the package as well. For Class 3,4 and 5 trailers, this is the hitch you want for a comfortable and peaceful hauling time. Its build quality is high so you can expect the CURT 17063 to stick around for years to come. Great efficiency and low noise operation, Husky 32218 is one of the best hitches you can get for the money. It’s a nice mix of a weight distribution hitch and a sway control device. This means you don’t have to outfit the hitch with additional accessories so this is an all in one purchase. 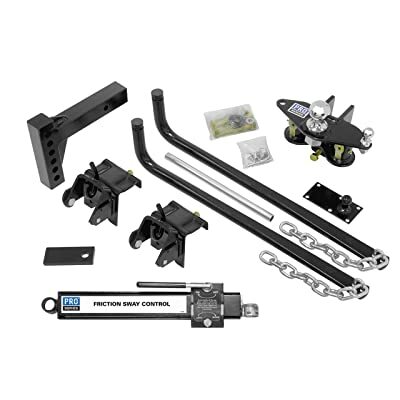 The components utilize hardened steel so you can expect the reliability and durability of the hitch are high. While it’s tough, the hitch doesn’t make a lot of noise when in use so you won’t be distracted. It’s easy to install and adjust thanks to the user-friendly construction. Husky 32218 come with the hitch ball already installed back at the factory and fastened to the right specification. All you need is a little time and effort to install the hitch since it’s a straightforward design. Parts of the hitch are sturdily made which further increase stability and endurance. If you are searching for a basic and robust product, you won’t be disappointed with the Husky 32218. It’s a simple and easy to handle hitch that can be used by people with the average technical skill. 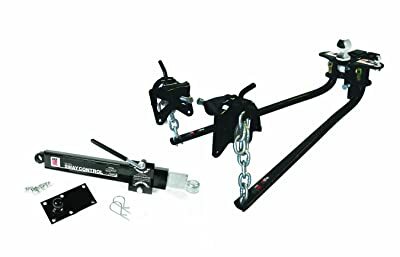 The e2 of Fastway is a popular line of weight distribution hitch and the 94-00-1061 is the version with the highest ratings. Available in round and trunnion bat style, it’s slightly lighter than other hitches at just 94 Pounds. At such weight, the ratings remain commendable and can support the usual trailer without little trouble. You will be provided with a step by step guide on the hitch assembling and installing procedures. As a result, you can get the hitch in place and work perfectly in a blink of an eye. With the integrated sway control, 94-00-1061 hitch makes sure that the swaying is eliminated after properly installed. There are no turning restraints with this product and precise adjustment can be achieved relative easy. Driver fatigues and worries are considerably reduced due to a stable construction which keeps everything firmly under control. Lastly, you can equip and remove the hitch quickly and effortlessly at moment notice. You won’t run into operation difficulties with this hitch anytime soon. 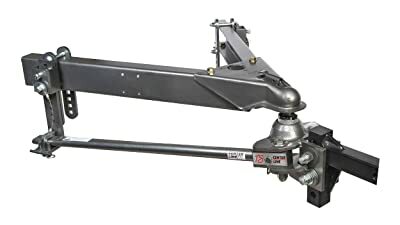 For light to average towings, Eaz-Lift 48058 is an ideal hitch to use with an all-around performance. With 6 Inches of vertical adjustment, you can adjust the hitch ball height to meet the conditions at the time. The bars use 100% heavy duty steel so the hitch functions perfectly under adverse situations. Several components such as the chain package and the u bolts are already installed on the bars so installation is simple and easy. With a solid product like Eaz-Lift 48058, your experience on the road with the trailer is significantly improved. And that are all the candidates for the best weight distribution hitch, see anything you like? Picking a weight distribution hitch is not easy if you don’t know much about it. But with the help of the information above, now you should have a general idea about an optimal design. Compare your preferences with the characteristics of the products then you can make a wise and informed decision.